A kitchen with matching cabinets creates a clean polished look; however, a more interesting design is working with mismatched cabinets. This type of design can be fun and produce a stunning unique kitchen look. There are many reasons you might decide to use a mismatched cabinet design for your kitchen. This style reflects a free spirit approach to design. You can customize and personalize your kitchen to fit your personality and tastes. If you're on a tight budget, buying mismatched cabinets may be a good option. 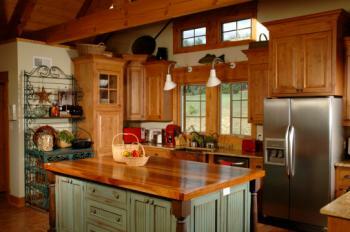 Canceled orders, discontinued styles and even salvaged cabinets are ways to cut the cost of a kitchen design. If shabby chic is your style, then mismatched kitchen cabinets are a must have, but you aren't limited to this one design style. You can use this design approach with country, colonial, modern and just about any other design style. The use of paint to transform the look of your kitchen is a cheap and easy way to achieve a new look. You can use a chalk paint method or go with a more conservative approach. It all depends on your personal taste and design style. 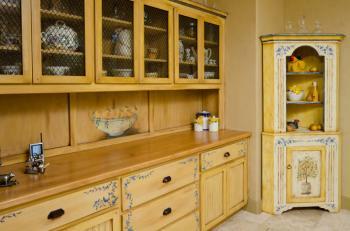 A popular trend for creating mismatched cabinets is to paint or stain the island an accent color. 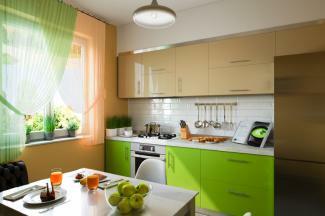 This can be any color you wish to introduce into your kitchen design. 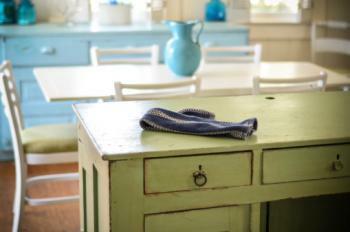 You may choose to mix stained cabinets with a painted island or vice versa. 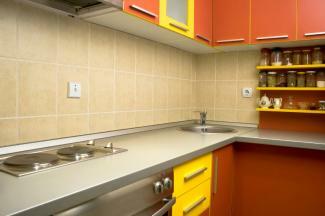 For example, if your existing cabinets are stained dark, you might decide to break up the monotony with color. A medium to dark hue is a good option so the color change blends with the stain. 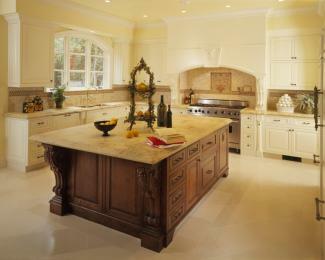 Light to medium stained cabinets can be paired with a color of either a darker or lighter hue to provide contrast. If you wish a more dramatic look then opt for a dark island with light cabinets or a light colored island contrasting with dark-colored cabinets. Cabinet finishes like this can be very attractive and effective when the color serves to move the overall design in a new direction. It's an excellent design change for anyone who wishes to redecorate a kitchen without the expense of complete renovation. Another great way to play up mismatched cabinets is with paint. Decide on the type of paint you want to use and if the cabinets will be high-gloss, matte finish, or a distressed appearance. You will then paint the top and bottom cabinets different colors. If this color scheme is too vivid for your taste, then opt for more subtle change in color, such as dark and light blue, medium and light blue, or dark and medium blue. You can also vary the color hues a few shades to give an effective but very subtle change. 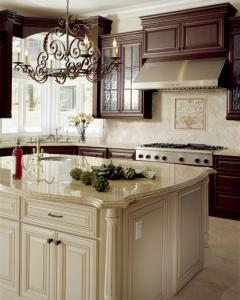 Paint the bottom cabinets darker than the top cabinets to maintain a balanced and grounded look. If you only want a splash of color, consider painting only the drawer facings. You can paint these using one or more colors. You may prefer to paint every other drawer alternating between two colors. If you're unsure about the colors and which drawers to paint, then paint pieces of paper and tape them to the drawers with painter's tape. This will give you a clear idea if your creation will turn out how you envisioned it. There are other ways to have mismatched cabinets and that's using the cabinet design as the focal point. Whether you're working with a tight budget or your lifestyle dictates the art of repurposing and reusing, you can have an eclectic, shabby chic, or truly modern look by selecting mismatched cabinets for your kitchen. The art to working with mismatched cabinets has two approaches. The first is to paint or stain all the cabinets the same color and allow the different cabinet designs to be the focal point. This works really well when you paint the cabinets. One great look is shabby chic by creating a distressed finish on the cabinets. This can be achieved with both stained and painted cabinets. Replace some of the doors on one set with glass doors to prevent overpowering the design with too much solid wood doors. This change out also allows you to introduce other colors into your design with colored china, glassware, bowls and other design accessories displayed in the cabinets. You can also paint behind the shelves to create a surprise pop of color. The second option is to use stencils to accentuate the cabinets. There are endless possibilities when going with this style of decoration. You can paint or stain the cabinets the same color and use different colored stencils on each cabinet style. You may decide to use the same colored stencil on all cabinets. Play around with ideas before settling on the best choice for your design. There are other ways to create the look of mismatched cabinets that are cheaper than installing complete sets of cabinets and faster than repainting to create the look. You may find that adding a china cabinet or hutch is a cheaper avenue than replacing existing cabinets. If you have room in the kitchen to include another piece of furniture, then you can treat is as though it were a cabinet when it comes to the finish. This piece of furniture can then serve as a contrast section in your kitchen design. Cabinet designs or paint colors aren't the only ways you can create a mismatched kitchen. You can also use different cabinet door pulls/handles and drawer knobs/handles. Using mismatched hardware is a fast way to create that mismatched look. Paint wooden knobs different colors or every other knob a different color. Handles can be mismatched but in the same metal family, such as different patterns in antiqued bronze or a sleek modern look with shiny chrome or nickel finishes. Perhaps the easiest way to give a mismatched cabinet look is to replace the doors and drawer facings on existing cabinets. You can rework all the kitchen cabinets and drawers or you may prefer to replace these in a random pattern. There is one design rule that guarantees a successful design when working with a mismatch approach. Be sure that you are consistent in your design; even if things are mismatched on purpose, you still should approach the design style with a plan. Consistency in design translates to deliberate intent and this results in a successful design.